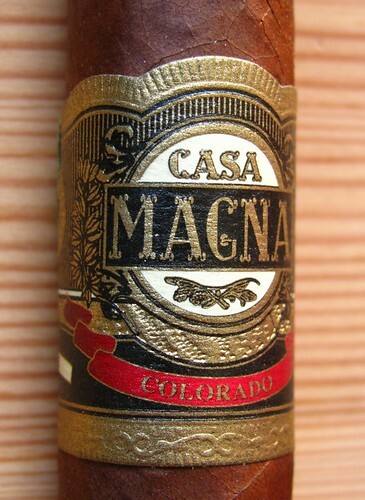 There have been many words typed around the cigar-loving part of the net about the Casa Magna Colorado line since it was named cigar of the year in 2008 by Cigar Aficionado. I have to admit that a year ago I was still smoking the odd cigar maybe once a month or less, the stogie bug hadn’t bit me and I didn’t even care about who made CA’s top 25. It is funny to read the reactions around the web at the time as most people had never even heard of this brand. How things change… I have three humidors now and Casa Magna is an established brand. While the top 25 list doesn’t shape my buying habits it certainly tickles my curiosity, so having received this Casa Magna Robusto from a fellow BOTL on UKCF (thanks CJ!) I was planning on smoking and reviewing it to coincide with the 2009 list, but got just a little sidetracked by other things. Jump a few days later and here I am cigar in hand ready too light up my sample of CA’s 2008 cigar of the year. The Nicaraguan puro cigar is made in Nestor Plasencia ‘s Segovia Cigar Factory but it actually is a collaboration between Plasencia and Manuel Quesada of MATASA. It’s a Nicaraguan puro made from Habano seed tobacco and the “colorado” refers to a Cuban cigar term to describe the dark reddish brown color of the wrapper, and is by far my favourite wrapper shade. To be honest, it is hard to review this cigar objectively knowing its accolades on one side and the underwhelming reactions many have had once people managed to get hold of these, but here’s to trying. Appearance wise, I think the picture above says it all. I am not particularly sold to the band design, but it is clearly made with quality in mind. The oily wrapper has a fantastic hue, it has a few veins but these are really thin and the seam and double cap are faultless. It feels quite nicely packed with little give: it has one tiny soft spot near the foot and a hard spot under the band which ended up causing some woes. Once cut the draw is perfect for my taste, a little resistance but not too much, which brings earthy and peppery notes. One thing I was afraid of with this stick was how it would burn; I had read about some pretty bad experiences (like a few posts on this UFCF discussion) or Stogie Review Walt’s short ashes review (linked at the end). This one burned great, very thin burn line, almost picture- perfect straight and slow. The ash was pretty cool, light gray and staying on for the whole first 3rd of the cigar and dropping off only once it reached the 2″ mark. The flavours are complex but while the basic Nicaraguan spice and earthy cocoa are nice and strong, the other aromas that pop up after the first five minutes are more hints than clear notes. I noticed toasted notes some dry fruit (cherry maybe) and some caramel sweetness. Nice, but if these were more evident I would have been even happier. … but it was. Soon the tiny crack had become a full-fledged wrapper split and half an inch into the last 3rd the only thing left to do was to get rid of the wrapper and smoke the cigar “naked”. Unfortunately I didn’t have my camera along while I was smoking otherwise I would have loved to document the cigar-crash. The aromas here were simpler, wood on earthy notes and more pepper, but the cigar quite quickly tended to overheat and become hot and bitter. I would say that the answer is “depends how you look at it”. If you smoke this thinking best of 2008, then it is underwhelming. It is really hard to imagine what reasoning CA used when they chose this as best of 2008, except for creating a lot of noise in the cigar community. On the other hand, as my mate jdawg pointed out , if you look at this as a 5$ stick it is well worth the money. It gets an 87 from me, mainly for the issues with the burn and wrapper at the end, but without these it could have made 90 easily. I think it is a well made cigar, pleasant, but certainly more something for people who are looking for subtle flavours and not bold gutsy ones; I for one would have liked it better if those initial notes were stronger, still for the price I’d buy a 5-pack without thinking about it… if ever I found them available, that is. This entry was posted in Cigar Reviews, Nicaraguan and tagged Casa Magna, Cigar Aficionado, cigar of the year, Cigar Review, Nicaraguan cigars, Plasencia, Quesada. Bookmark the permalink. Another great review! Thanks for including me in your blog. I think if you smoke this cigar with the expectation that is was “Cigar of the Year,” you will be disappointed. If you smoke it with the expectation that it was a $5 smoke, you will be pleasantly surprised. A good, honest review there my friend and sorry to hear about the split issue. I’ve had mostly successes with the few of these and the Toro I’ve smoked. Most had the mentioned hard spot and seemingly always near the band. I think Jerry sums these up as above. Don’t believe the hype, but smoke some. I, like yourself, would have no problem grabbing a fiver here and there. thanks for the comment and especially thank you for sending me this Casa Magna, it was great to have a chance to try it. You and Jdawg sum it up very well. The split is something that can happen, and in part I have the feeling that the quality control (or lack thereof) on these has been a victim of the success these had. Still, like you, I would buy 5 without a doubt. 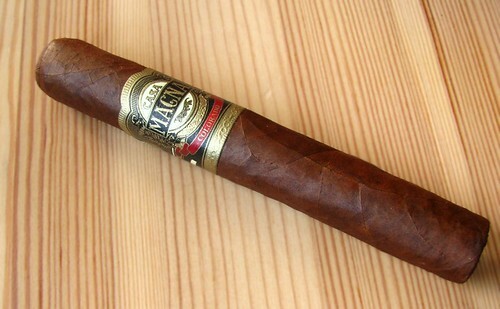 I have a box of the original production run Casa Magnas and they are fantastic in every way. They taste, draw and burn flawlessly — every time. Now, I’ve also tired a few “newer” ones from cigars shops in late 2009 and again in 2010. These are nothing like the originals that won cigar of the year in 2008, but they are much like what you described. An average smoke that is very good for the price. I have not encountered many newer smokes with burn issues, but the flavor is only a faint glimmer of the originals. I think the cigar of the year rating caused a run on the factory and production suffered. Thank you for the comment Jade. It is very interesting to hear the opinion of someone like you who had a chance to taste the Casa Magna before it boomed. It would be nice if producers would keep their standards up even once they get succesfull, but I guess it is a matter of either keeping your production very limited to keep rolling the cigar with the best tobacco leaves or get standards down and cash in… disappointing for us cigar lovers but from the business point of view it is understandable. Still… I would have loved to try one of those 2008 Casa Magnas!